summer is my favorite, season - the sun is out and there's not a cloud in the sky. It's the perfect time to lay back and relax with a cold drink in hand or play a little golf. For our summer Colors of Paradise collection, I wanted to bring the photo shoot outdoors - and the beach scenery inspired by a trip to a trade show.... I was strolling the streets and noticed the most beautiful fabrics in a windows display. i wanted to translate the colors into the summer collection and incorporate them into the wardrobe fr the photo shoot. The end result? 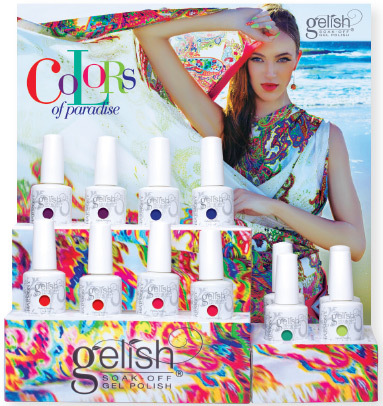 The Gelish Colors of Paradise collection - six brand new colors that have a different twist on the bright colors that are typical of the season. My favorite pick from the collection is definitely "Mali-blu Me Away." I think the blue is going to be a huge hit! 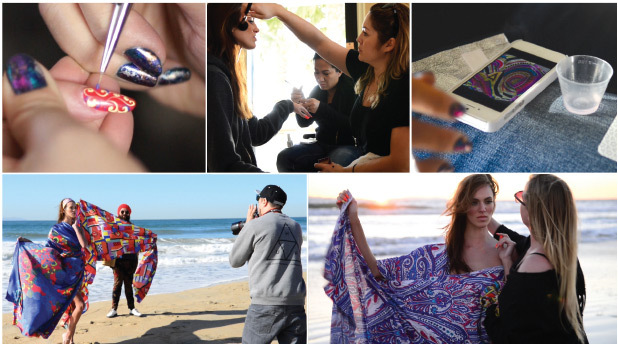 cool, clam water and clear blue skies... no one would've ever known that the photo shoot for the Gelish Colors of Paradise Collection took place in the dead of winter! Shot on the beach in sunny, Southern California, there was a slight chill in the air, but the sun was still out! A selection of hand-picked fabrics were draped perfectly to convey a portrait of blissful paradise, while a rounded-almond shape for the nails was elegant yet fashion-forward. The bright hues in the Colors of Paradise collection combined perfectly with the wardrobe, hair and nails to create summertime magic.